Yunsoo and Brice’s wedding was absolutely gorgeous! They really focused on keeping things simple, yet celebratory. They had a great group of friends and family to celebrate with, so spirits were high and happy all day long! We love the Yunsoo spent time with her ladies getting ready. You can see she jumped in with hair & makeup assistance, which was so sweet! She was super relaxed all day, just as we want all our brides to be! 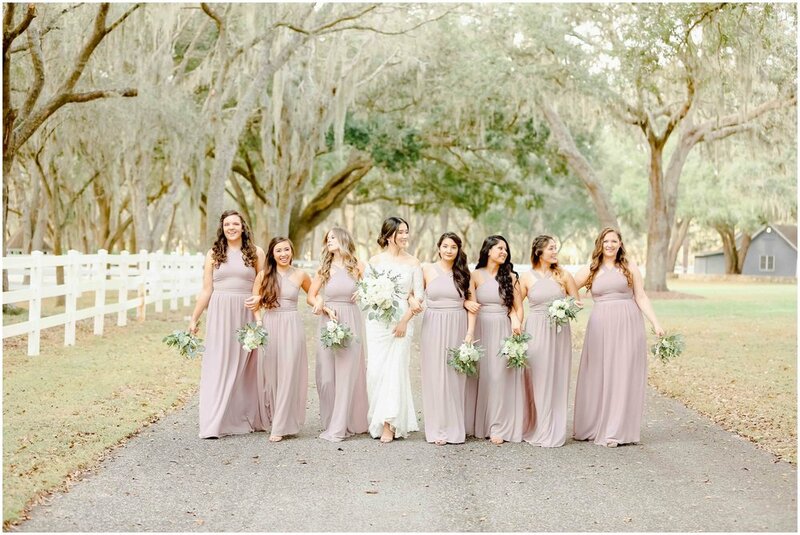 The wedding party’s attire choices were fantastic- the groomsmen wore a soft grey suit, while the ladies sported a soft mauve floor-length gown. The combination was enhanced with Brice’s perfectly tailored charcoal suit and Yunsoo’s stunner of an off-shoulder lace gown. The lovebirds tied the knot at the “I Do Tree.” Although it sprinkled a tiny bit, it was the sweetest reminder than the couple will be able to weather any storm together and to embrace the showers as they come. They took it in stride and sealed their vows with the perfect kiss! The couple selected our Antique Blue Barn for their reception. Although the inside is now climate controlled and can easily accommodate guests, the weather turned a corner and was perfect for outdoor dining & celebrating! The tables had the prettiest gold box candle holders with sprigs of eucalyptus adoring the base. It was a beautiful day for a beautiful couple. We’re so happy for you two!